Years ago, when Ted Hotaling was playing professional basketball overseas, he went in for a pump fake and fell. He slammed his head on the hard court. Hotaling was lucky. His coaches and athletic directors held him out and sent him to the hospital after the game, where they discovered he had a concussion. Back then, there weren't stringent concussion protocols, and people didn't know that cumulative hits to the head could cause lasting damage to an athlete's health. "At the time, concussions weren't on the forefront on a lot of people's mindsets as they are now," recalled Hotaling, who is now the head men's basketball coach at the University of New Haven in Connecticut. Even now, when most people think of sports that pose concussion risks, they probably think of football, hockey or X Games-style snowboarding and skateboarding -- not basketball. But in 2010, a study in Pediatrics showed that 375,000 youths are sent to the emergency room each year due to basketball-related injuries. Although the total number of injuries declined over a 10-year period, the report highlighted a 70 percent increase in traumatic brain injuries on the court. Just this past December, a Seton Hall college basketball player was hospitalized for a few days when he was fouled and came down on the left side of his head. To help protect their players, the University of New Haven men's basketball team is turning to technology. During practice, players wear Triax head sensors that are small enough to be slipped into a headband. The sensors track the g-force of a hit to the head, which can cause jarring movement of the brain inside the skull. The data is then sent wirelessly in real-time to computer software that compiles the findings. Athletic trainers can then see which player just got hit in the head and how hard the hit was. They can track how hard and how many times that player sustained a head injury during that practice, the season, or even the course of their sports career. At the end of the season, the University of New Haven will send the data to the Sports Legacy Institute to help further concussion research. Chris Nowinski, a former athlete himself, co-founded the Sports Legacy Institute with Dr. Robert Cantu, a clinical professor of neurosurgery at Boston University School of Medicine, in order to learn more about concussions and spread awareness about their dangers. The Sports Legacy Institute is known for its partnership with Boston University to study chronic traumatic encephalopathy (CTE), an Alzheimer's-like brain disease that is diagnosed after death in athletes who experienced repeated concussions and head blows during their athletic careers. The collaboration is sometimes referred to as the CTE Brain Bank. Nowinski explained that the data collected by the Triax sensors will help medical professionals diagnose concussions and better understand their impact on health. Because the sensors are small and can be worn in virtually every sport, they are looking to collect data on a variety of different activities. "This will eventually be on everybody's head so we can understand really what are the risks to the brain in these sports," he said. Nowinski has had personal experience with concussions. He played soccer from kindergarten through eighth grade, before picking up football in high school. He ended up becoming an all-Ivy defensive tackle at Harvard University. "(I) never had a diagnosed concussion in my entire soccer or football career, although now I know I had them. I just never thought twice about them," he said, speculating that he's suffered at least 10 concussions that he can remember. After college, he joined the WWE "Tough Enough" reality TV program in 2001, and had his "Monday Night Raw" pro wrestling debut in 2002. In June 2003, he got kicked in the head and forgot what he was doing. He finished the match, but headaches persisted. "I thought there are guys here wrestling with torn ACLs and fused necks and all sorts of pain, and all I had was this throbbing headache and a little nausea when I get my heart rate up. I thought that feels like the flu and I've wrestled with the flu before, so why can't I wrestle with this?" It wasn't until five weeks later -- after he fell and injured himself while sleepwalking -- that he realized it was a serious problem. Even now, 10 years later, "I still can't sprint without getting sick." he said. "Every time I play sports I'm still at 80, 85 percent. I never try to push past that or else it will cost me a couple of days." He's hoping the head sensors will help make a difference for others. In addition to gathering data, the sensors also provide an invaluable tool by raising an alert the moment they detect a concussion. Many players admit they would try to stay in the game and downplay their injury otherwise. A May 2013 survey revealed 53 percent of high school students would continue to play even if they had a headache stemming from a head injury. Just 54 percent said they would "always or sometimes report symptoms of a concussion to their coach." "As a competitor, as a player and obviously as a coach you want them to get back, but fortunately for us, we have people who are experts in the field who are making the right decisions," Hotaling said. "Now with these sensors, there's much more of an awareness, and we have much more intelligence (to let us know) when they're ready to get back on the floor and in the classroom." New Haven junior guard Ashanti DePass admits that he never used to worry about concussions. But he was surprised to find out that he was absorbing head blows during practices. "You don't really realize it's bad, but trainers can step in, and bring you off to the side, and make sure everything is all right before you keep going along in practice and hurt yourself further," he explained. In Nowinski's opinion, the culture of sports has to change. But in the meantime, he said, wearing a sensor takes the pressure off a player to self-report. "Somebody on the sideline will be able to recognize through the technology that that person took a hard hit, and take them out, and take that pride issue out of being pulled off the field with an invisible injury," he said. "Because remember, it's easy when you're limping off or you're bleeding to say, 'Oh he's injured.' But if you just walk off the court with nothing, with no blood, no obvious injury, people question you." 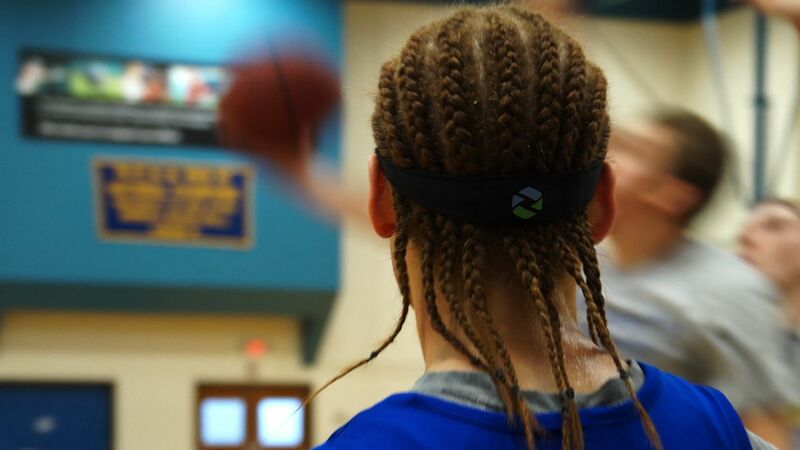 The University of New Haven basketball players admitted they weren't crazy about wearing the sensors at first, but soon got used to them. "I've never played with a headband before. It was something new. But, once I was told what they were used for," junior guard Jeffery Atkins said. "I put it on, once you put it on and you start playing, you don't really feel it. It's like it's not even there really." Now, they're grateful they have them. "I don't ever want to get taken out because of a hit," said DePass. "I would just want to continue playing. But [the sensor] actually helps because being hardheaded in that situation just isn't the best idea."